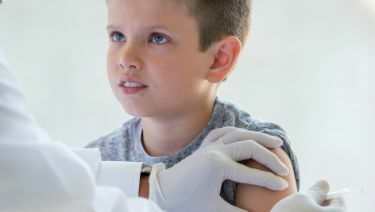 Healthy Children > Safety & Prevention > Immunizations > Which Flu Vaccine Should My Children Get This Year? Which Flu Vaccine Should My Children Get This Year? It's that time of year again - flu season. Many people don't realize it, but the flu can be a very serious illness. It causes thousands of deaths in the United States every year, some of which are among previously healthy children. As a parent, the best thing you can do to protect your children from the flu is to get them vaccinated. Everyone around them should be vaccinated, too. What types of influenza vaccines are available? This year, the 2018-2019 influenza season, there are two types of influenza vaccines available. The first is what many people call the "flu shot." The second comes as a nasal spray. The American Academy of Pediatrics (AAP) recommends the flu shot as the best choice for children for the 2018-2019 flu season. What about the nasal spray flu vaccine? There has been a lot of confusion about the nasal spray flu vaccine because it was not available for the past couple of seasons. Also known as live attenuated influenza vaccine (LAIV or FluMist), it is sprayed into the nose. It has weakened viruses that slowly reproduce in the lining of the nose, giving the body a chance to recognize the viruses in order to develop immunity. When it first came out over 10 years ago, the nasal spray flu vaccine worked really well to protect people, especially children, from getting the flu--maybe even better than the flu shot at that time. The Centers for Disease Control and Prevention (CDC), which keeps track of all kinds of diseases for us, monitors flu activity in the United States. They also keep track of how well the flu vaccine works every year, since every flu season is different with various strains of the virus circulating around the country and the world at any given time each year. Based on this information, vaccine formulations usually change year to year to be as effective as possible. Some years, the flu vaccine works really well in preventing cases of influenza, and some years not as well. Even in years where it doesn't work as well, though, it almost always offers some level of protection from catching the flu. Surprisingly, though, the nasal spray flu vaccine really did not work at all in protecting people from getting the flu in three straight seasons (2013-14, 2014-15, and 2015-16). Because of this, the AAP and CDC decided to recommend only the flu shot – and not the nasal spray – for the past two flu seasons (2016-2017 and the 2017-2018). No one was really sure exactly why the nasal spray flu vaccine wasn't working, so its manufacturer did a lot of work to try to figure out what happened, and how to fix it. So, should I get the shot or nasal spray for my child this year? Both the AAP and the CDC want as many children as possible to get a flu vaccine each and every year. The AAP recommendation this year is that all eligible children 6 months and older should get the flu shot. The AAP reviewed the data about the latest form of the nasal spray and made the decision that there just was not enough new information to be confident that this season's nasal spray flu vaccine would work as well as the flu shot to protect children. The CDC decided to go ahead and recommend the nasal vaccine as an option for the 2018-19 flu season, along with the usual flu shot. Still, The AAP recommends children should only get the nasal spray this coming year if they are healthy and at least two years old and wouldn't get vaccinated otherwise--for example, if your child is absolutely refusing the shot but is willing to get the nasal spray or if your doctor is out of the flu shot but has the nasal spray available. What about next year (the 2019-2020 season)? We all hope that the changes made to the nasal spray by the manufacturer mean that it will work well this year. As always, the CDC will collect and review information about how it is working by early next year. If we see that it works, it will be fantastic to have the nasal spray back as an additional option to recommend for protecting our children from influenza for the 2019-20 season. Remember, getting vaccinated is the best way to protect yourself, your children, and other loved ones from the flu! Sean O'Leary, MD, MPH, FAAP, is a pediatric infectious diseases expert at the University of Colorado and the Pediatric Infectious Diseases Society Liaison to the Advisory Committee on Immunization Practices. Within the American Academy of Pediatrics (AAP), he is a member of the Childhood Immunization Support Program Project Advisory Committee, the Committee on Infectious Diseases, the Section on Infectious Diseases, and the Council on School Health. Dr. O'Leary is also a Chapter Immunization Representative for the Colorado Chapter of the AAP.